Why should you add drama to your day? Ok, let’s be clear about the kind of drama we’re talking about. This isn’t Real Housewives or “who ate my lunch out of the staff room fridge?” drama (we’ll save that for another post on another day). This is the dramatic arts where students learn how to perform, present, speak, write, act and maybe even dance (it’s like we can hear our students giggling when we dance for them). You have SO much to do every single day. 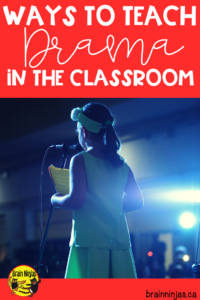 The thought of adding drama into your classroom on a regular basis probably sounds overwhelming and maybe even ridiculous, but just hear us out. Some of your students will LOVE drama activities. Some NEED drama activities. And why not make learning fun and memorable? That is not reason enough. But maybe the science will convince you. For students with language delays or learning difficulties, the non-verbal component of drama can help develop their communication skills. Learning facial expressions and how our emotions change our appearance is an important skill, but drama makes that skill more accessible to all of our students (and hides it behind fun so students are more open to experimenting). English Language Learners can be on the same playing field with their classmates when no one talks and only mimes out actions. Taking words away from students makes them think about their facial expressions, body shapes and how they communicate without words. If words are being used, English Language Learners can take visual cues from their classmates to watch and copy actions while they build vocabulary. Drama helps students understand and develop their spatial awareness. They can change their body shapes by size (small, big, medium), shape (round, flat, pointy), speed (run, walk, skip), speed (heavy, light, stuck to the floor) or much more. Have your students explore in a larger space like a gymnasium to really stretch out the fun. Drama can help teach social interactions like eye contact, facing speakers, and how to communicate clearly. These types of skills are acted out in drama, but students who need social skills taught explicitly, this can be a low-risk way to learn these skills. 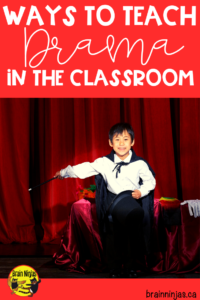 Teaching drama in the classroom is more than just the acting part. There are opportunities in the dramatic arts for sound technicians, lighting crews, set design, props design, costume design and so much more. Your students might have hidden talents you don’t even know about. Personalities can be developed through acting. Students observe others acting in specific ways they can emulate such as how to approach a person, ask a question or make a speech. Often the students that surprise us the most in drama, are the ones we expect will enjoy it the least. We get to learn about our students in all new ways. Set the stage. Show off your acting chops in a way students can imitate. Use silly voices. Act things out. Provide opportunities for low risk-or no audience-performance. Put students in small groups or partnerships and slowly build up their confidence. When students ask to perform for others you’ll know they’re ready. Never force anyone to perform. Instead, offer students the chance to pass, but then come back to them offering them another chance to try. Create a comfort zone. Let them decide and set up a classroom environment that performs as a team. Students who panic and want to step back, let them and let someone step in to cover for them. They’ll come back if you don’t pressure them. Try drama circles. These give students a chance to act for a very small amount of time, so it’s low risk. We’ve been working on writing some for our students and you can give them a try. If you’ve ever played an I Have…Who has…? style game, it works the same way. They are also available in a bundle. Puppets are your friend. Yes, it’s crazy. No one likes puppets (or do they? ), but they are a way for students to talk through an object where they can stay “safe” while performing. You would be shocked at how much fun finger puppets can be with fifth graders. Ask your kindergarten teacher friends where to find some puppets. Watch a short video about how to use drama circles with your class. Dramatize everything. Try different methods to let students perform without really having to be in front of an audience. Record videos, write and perform puppet plays, create small acting opportunities like public service announcements or leading assemblies at your school. Look for low-risk audiences. Younger students LOVE everything older students do-even just reading out loud to them. Create opportunities for your students to feel like leaders in everyday situations. Use your kindest words. This is not the time to critique performances. Build students up so they build confidence. They’ll be able to refine their skills when they are more comfortable. Make your mistakes publicly. Allow your students to see you make acting mistakes so they can see how you overcome them. Teach and model how to improve with your own acting-instead of the work of students in front of other students. 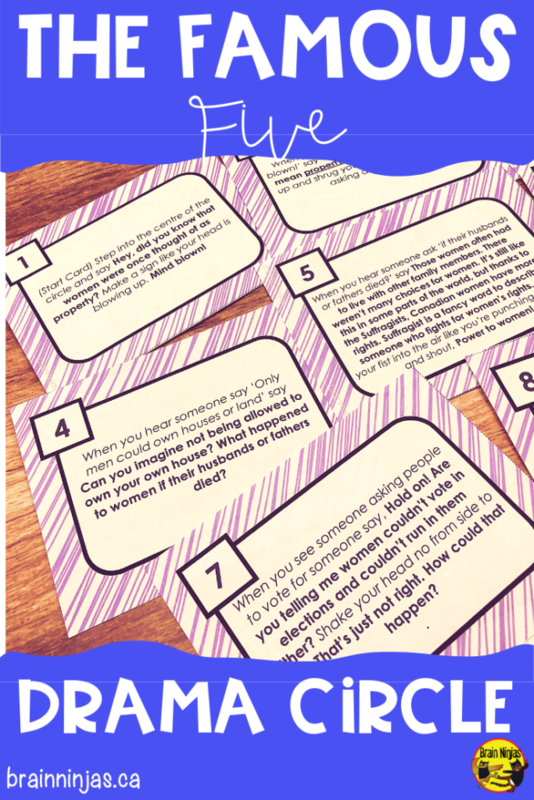 Why don’t you try out some of these quick drama games you can play in the classroom? Mirror Face: Partners stand facing each other. The first person moves their hands or arms around slowly while the other partner tries to be their mirror. The first person can also try facial expressions or other movements while their mirror copies. After a few minutes switch roles so the other person can be the mirror. Mannequins: In partners, one person is the mannequin and one person is the store clerk. Being respectful when touching the other person, the store clerk moves the mannequin into an interesting but comfortable position. We usually give our students about thirty seconds to do this. Then, we have each store clerk explain what they have created. Reverse roles and play again. This is Not a Towel: Grab a clean tea towel or small towel. Have students stand in a circle. The teacher demonstrates first. Holding the towel say, “This is not a towel. This is a…” and then you fill in the blank with an action that you can use the towel for. For example, “This is a cape.” And then you would wear the towel like a cape. Then pass the towel to the next person in the circle. The game continues until everyone has played. Allow your students to pass once if the game or drama is new and then come back to them at the end reminding everyone that it’s ok to take a chance or borrow someone’s idea if they’re really stuck. Follow the Leader: This can be a simple one that you do on the way from one place to another, but remember to keep it quiet and safe if you are moving through the hallways. You can also warm up during a gym class or take this outside. It works anywhere there is a line up that is moving. Freeze Frame: Give students a simple topic that you might be covering in your science or social studies class and ask them to create a “picture” where everyone it in freezes in place. Have the spectators try to guess what the frame is showing or move some of the positions around to change from one scene to another. This is similar to a tableau. Charades: This is one of the easiest possible games to play. 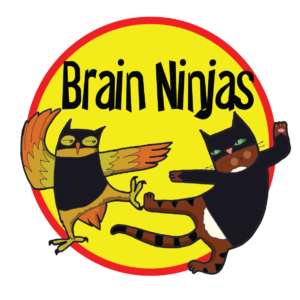 Make a list of books, movies, TV shows or a topic you are teaching in class. Put these on small pieces of paper and toss them into a bowl. Have a student draw a piece of paper and then act out what is on it. Have the spectators guess. Emotions and Facial Expressions: Create a set of items students can draw from a bowl using a list of feeling words like happy, embarrassed, irritated, lonely or joyful. Have one student act out the emotion while the others try to guess it. This one is a great to expand the vocabulary of your students and English Language Learners. 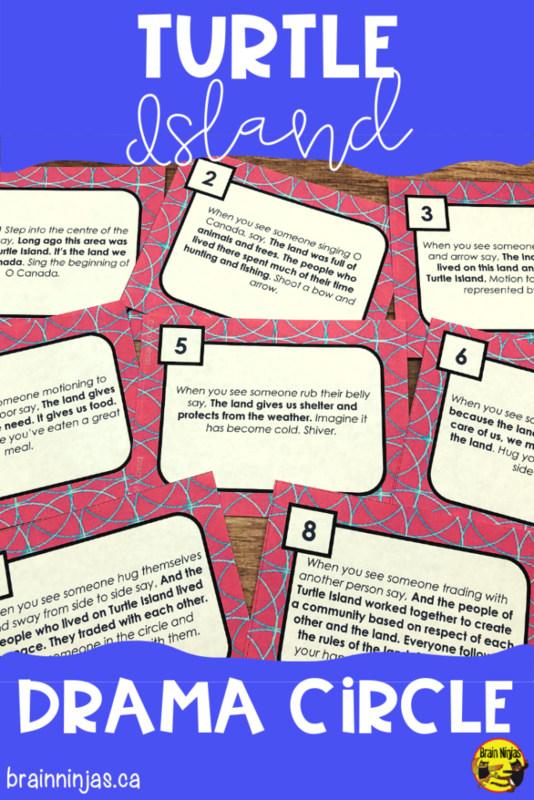 Improv Games: Once your students have a little experience, try doing some improvisation. This is where students can to come up with information and a character on the spot. One of the easiest ways to start is the character, location, problem scenario. The audience calls out a character (like a unicorn), in a place (like a skating rink) with a problem (is one skate short). This character has to interact with another character (like a talking pickle) that also has a problem (going to get caught being out after curfew). And then you just let the magic unfold. It helps to have a magic word where the actors freeze (so you can get a little control back if the scenario doesn’t quite work out). Story Retell: Read your students simple stories like fairy tales or picture books (older students love being read to and love picture books so don’t let that stop you). Have your students act out the stories as a retell. This is a great way to bring literacy into your drama and drama into your literacy. 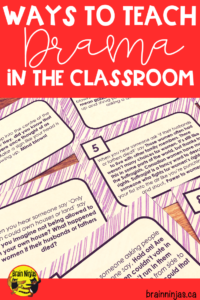 You can also use historical events, science concepts (like the water cycle) or anything else you teach that has a series of events or stages. Mouth Watering Goodness: Have one student tell the class all about a food that will make everyone’s mouths water. Encourage descriptive language, facial expressions and body movements to try to make the yummiest possible food. Make it a competition and have other students try to “out-water” the others. The reverse of this is to try to describe the most disgusting food and make people cringe. Make Masks: Allow your students some time to make masks in your art class that they can use in your drama. 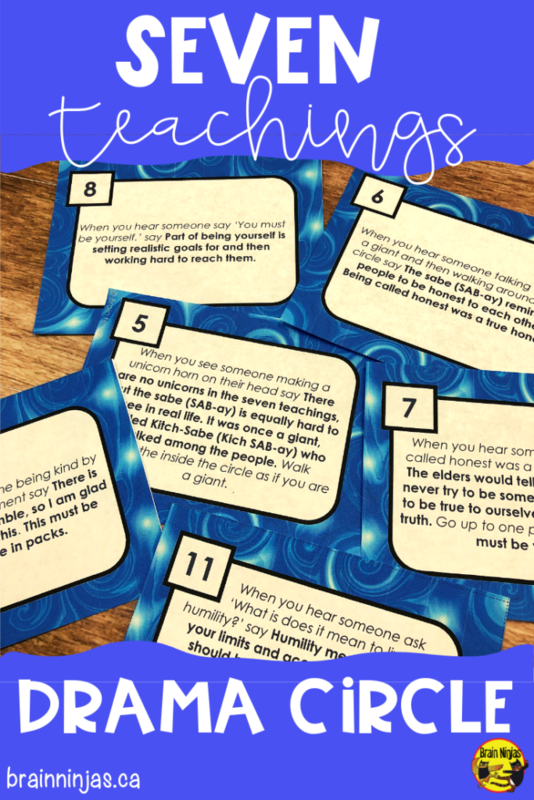 Connect it to your lessons by picking characters from books you’re reading or historical figures. Group Task: Put students in small groups of four or five students. Give them a “task” (like grocery shopping, setting up a campsite, or riding a roller coaster) that they have to complete as a group without talking. See if the other groups can guess the task. A variation of this is to have the students riding in a form of transportation (like a garbage truck, bus, sports car or escalator) while everyone else guesses. 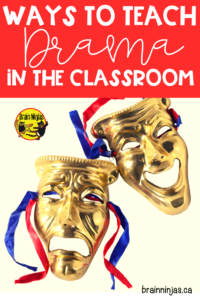 Do you incorporate drama into your classroom? We’d love to hear how you do it including your successes or challenges. Share a comment below.